Sephora Favorite sets are the perfect way to try out a product from different brands at a reasonable price. I will usually be drawn to the Sephora Favorites Lip sets, but this time I decided to go with a liner set. I use liquid liner every day, so you can imagine I run out of it fast. I figured this would be a great way to try out different liners and see which I really liked. More info and pictures below! 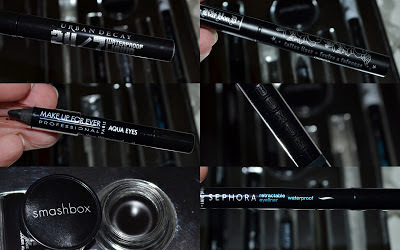 Smashbox Jet Set Waterproof Cream Liner, Urban Decay 24/7 Waterproof Liquid Liner, and Sephora Collection Waterproof Retractable Eyeliner in Black Glitter are all full size. That already is an amazing deal and a great way to try different eyeliners. I have given them all a try and they are really long lasting! I don't use pencil liner too much, but at least I have a few now that are from great brands. The Smashbox liner took some practice to get used to, but once I did I loved it. This is a great set someone you know that loves their liner! Sephora Favorites Draw The Line Eyeliner Sampler retails for $28 and can be found at Sephora stores or online. This looks like a great set, and with 3 full-size liners, it's definitely a good value! WOW, just added it on my wishlist! That really is such an amazing deal!